When I lived in New York, Sunday brunch was one of my favorite things to do. Lie in bed for a little and drink coffee/ watch TV, and then around 1 or 2 go meet a friend for brunch. Living in Williamsburg, the options were endless and I definitely grew an affinity for poached eggs. However, there were also pancakes and waffles made out of creative batter and interesting breakfast sandwich combinations galore. Now that I have moved to Israel, one of my favorite things to do is still brunch—but rather than on Sunday, on Friday morning. In Israel, the workweek is Sunday-Thursday because of Shabbat so Friday is the time people really go out to brunch. I also notice people tend to go earlier—perhaps to avoid the pre-shabbat rush of shopping/ everything shutting down. Israeli breakfast food is also not like American breakfast food. Waffles are available in limited places, but they are thought of more as dessert or snack food. Pancakes I have yet to see. Israeli breakfasts seem to favor eggs—either scrambled, fried (in Hebrew, they are called something like “eye” eggs) or alternatively poached in shakshuka. Israeli breakfast traditionally includes “lavana”, like cream cheese but healthier; Israeli salad made of cucumbers and salad; bread; and more. This means that Israeli brunch combines the best of American breakfast (eggs) with Israeli food--delicious espresso, mezze and salads. 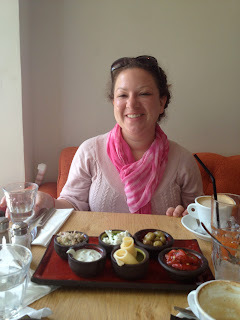 SO, here is how to order an Israeli breakfast! 6) finish with a green salad if you have room! Then the Main Course and Salad Arrives. Sometimes places will put their own spin on things. I went to a bagel place in the Americanized German Colony (Jerusalem’s very own Upper West) and on their menu they had Spanish, Italian and French interpretations of Breakfast. No matter what you choose, you leave full of fresh fruits and veggies and some protein-rich eggs. Well, at least I tell myself that... But what really makes Israeli brunch so impressive to me is that it is an endless meal at an insanely reasonable price: I have never seen Israeli breakfast for more than NIS60.00 (approximately USD15.00). To me, Israeli breakfast is the breakfast of champions.